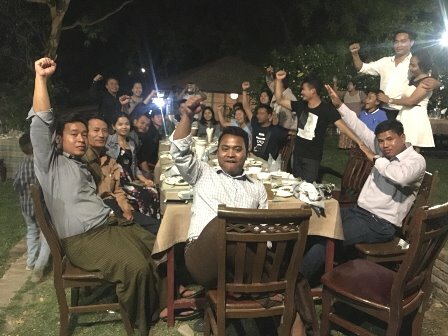 Six leaders and members of the HLOB union at Hotel Tharabar Gate in Bagan were released from prison on March 29 to an emotional welcome from family and union members after serving their full 30-day sentences. The six were tried, convicted and immediately taken to prison on March 1 after being arrested in December for attempting to lead a peaceful march to protest the brutal police destruction of their solidarity picket. IUF members around the world demonstrated at Myanmar embassies and diplomatic mission to demand their release.